The Network Design Cookbook is a guide that provides a structured process that you, as a network engineer or a consultant, can use to meet your critical technical objectives while keeping within the parameters of industry best practices. 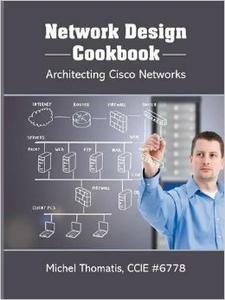 While it primarily deals with Cisco equipment, the Network Design Cookbook lays out a design process that allows for the incorporation of products from other vendors. In this book, you will find valuable resources and tools for constructing the topology and services you need, with step-by-step design assistance for many solutions such as LAN, WAN, Data Center, Internet Edge, Firewall, and Collaboration. The Network Design Cookbook explains not only the importance of designing an ideal network, but also the consequences if the design is not well thought out. This book will be a valuable tool in both learning how to design a network, as well as a reference as you advance in your career.